The roaring ’20s: Flappers in the Pera Palas Hotel were dancing the can-can, Art Deco was all the rage, the Turkish Republic was born. Hope, progress and newness double-stepped to the beat of Kemal Atatürk’s drum. This was the backdrop to which two Istanbul bakers, Filip and Yorgi, opened a whimsical chapter in the culinary story of the city. The fruit of their labor, Baylan Pastanesi, remains an honored institution, if not for the sheer excellence of its desserts then for the sweet taste of nostalgia. 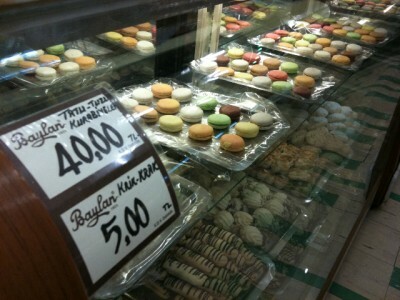 And that is what you feel when you walk through the worn swinging doors of Baylan Pastanesi in the Kadıköy market. To many Istanbulites, it must be a tender reminder of the days when local places got classed up with European names (the original shop was called L’Orient) and men wore hats (the brimmed kind, not the knit ones). We felt a similar twinge breathing in the sweet smell of chocolate and the must of wet counters as we walked past the low display case of macaroons and chocolates. We could have been at classic sweets shops like Cupid’s on Chicago’s Southside or Parkside Candy in Buffalo. Along with a glimpse of yesteryear, people come to Baylan to eat the kup griye, a vanilla ice cream dessert that our waiter described as the atom bomba. Riddled with slivers of toffee and swimming in caramel sauce, its effect was less explosive than promised, but satisfying nonetheless. In a land where local ice cream is handled by fez-clad boys swinging it around with a crowbar and banging a cowbell, the velvety kup griye felt, well, classy. The wacky Adisababa was another story. In full form this chocolate-coated ice cream fruitcake looked like a magician’s black hat on a shelf. Was it the mystery of what lay within that encouraged such an exotic name as Adisababa? What were Yorgi and Filip thinking when they named this one? Certainly, the recipe didn’t hale from the dusty Ethiopian capital. Spellbound, we ordered a slice. Staring at the bubblegum-pink innards and tasting it gingerly while eying the delicious kup griye across the table, we pushed it aside, realizing we preferred class over sass. On the way out, we couldn’t resist a box of colorful macaroons. Our waiter offered a taste of his personal favorite, vanilla, and the light crunch of meringue gave way to a sweet creamy center. “Atom bomba,” we declared as he carefully wrapped the blue Baylan box with an orange ribbon. On our way out a customer was grousing about the service: Her family had been coming there for 50 years; didn’t they know who she was? The man behind the counter smiled and nodded. Of course he knew who she was. He, too, had been there for the better part of 50 years and could probably recall this customer stamping her tiny foot and pitching a fit after her first kup griye 30 years ago. Like Baylan, some things never change. Great post. The kup griye sounds amazing! Perfect article. It’s as sweet as Baylan’s macaroons. I am 32 yr old and my mother was taking me this unique patisserie since i was 5 yr old:) Probably she was going there way before i existed! They never changed the quality. The ‘fondam’ chocolates ( when u bite cherry liqueur pour in your mouth ) are also lovely! If you ever come to Kadikoy do not miss the chance to try this lovely, historical place.